Videogames Reduce Violent Crime in U.S. There are lots of studies pertaining to videogames and criminality, but how often do you hear that games reduce crime rates? According to a recent collaborative research project, both non-violent and violent games may help reduce the rate of violent crime in the U.S. The study suggests that people who game - even ones predisposed to violence - would rather spend their time playing videogames than actually committing crimes. To reach this conclusion, researchers from the Centre for European Economic Research, Baylor University, and the University of Texas at Arlington conducted a meta-analysis of a number of existing studies. Multiple studies show that videogames can, in fact, lead to a short-term rise in aggression, and aggression can be a cause of violent crime. However, according to the researchers in Understanding the Effect of Violent Video Games on Violent Crime, "[Video games] paradoxically may reduce violence while increasing the aggressiveness of individuals by simply shifting these individuals out of alternative activities where crime is more likely to occur." In other words, even if videogames inspire an individual to commit criminal acts, the simple act of gaming often proves more compelling than real-life criminality. The study does not rule out tighter regulations on violent videogames, but cautions against overzealousness. "Possible regulations of violent content in video games should be carefully designed," reads the paper. "They could lead to a reduction in long-term aggressive tendencies. However, in the short-term, they would probably lead to a rise in crime rates as a number of gamers would spend less time playing video games." This research presents an interesting dilemma. Evidence suggests that videogames can cause aggression, which could lead to violent crime. Tighter regulations could shift budding criminals out of their living rooms and onto the streets, which could lead to violent crime. 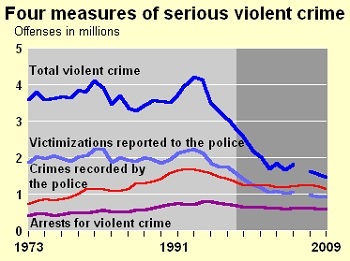 For now, though, violent crime is on the decline, and videogames may be a factor.